You are currently browsing the Breaching The Web blog archives for October, 2009. I just bought two pairs of reading glasses. One is a medium-bronze color with mostly rectangular lenses (they are a bit curved on the bottom), and the other is a shiny, pomegranate pink with very rectangular lenses. One pair is for work, and the other is for home — I don’t want to have to remember to carry them back and forth with me. The only question is, which is which? I know the more conservative pair should be my work pair, but I’m a rebel at heart. I tired on a fantastic frame that had pink leopard print arms. I really, really liked them — but sadly, they had a giant “G” logo on them (they were “Guess” brand). The G looked stupid, so I passed them by. I’m still fairly bummed about that. For the last year or so, I’ve been drinking just one kind of tea: Upton Tea Imports Tippy Orthodox GFOP Assam. I like it — it’s a hearty, smooth black tea with a nice flavor. But I’m getting a bit bored with it. Before I settled on this Assam, I used to buy several different teas and try them out — but I also got tired of trying. Recently though, I’ve started drinking Gen-mai Cha on occasion — on weekend afternoons, or busy evenings out when I need/want a bit of caffeine. Gen-mai Cha means “brown rice tea” which describes it pretty well. It’s a hearty green tea with roasted, puffed rice added to it. The puffed bits look like popcorn. You can also find versions that are made with roasted green tea, but I prefer the unroasted varieties. The flavor is like green tea, but toasty and nutty. I buy all of my teas from Upton (no affiliation, I’m just a satisfied customer), so I can’t speak to the quality of GMC teas from other sources. When did everything get so small? I have been working on several samplers for my embroidery class. I’m really enjoying it, except for one thing: everything is too small. Last night, for example, I was trying to undo a line of Portuguese stitch — which is a line of straight stitching that has loops over it. For the life of me, I could not see the loops. I turned the light up, I squinted, I cursed, and nothing made those loops easier to see. It was twilight, which is always the worst time for me to do handwork — there’s something about the quality of the light that eliminates shadows (and therefore depth) and makes it impossible to see well. But this was really bad. I haven’t had an eye exam for at least 8 years. I think maybe I need one. I’m struggling a bit with the solo I am preparing for our bell choir concert. I can play the piece perfectly, but it has become a bit stale for me, and I’m making random mistakes each time. The mistakes are always different. Someone suggested to me that I am not in the moment enough, that I’m distracted. I think this is probably correct. I’ve been doing a bit of reading about how to be “in the moment” for a performance, and I found this piece by David Leisner enormously interesting: Six Golden Rules for Conquering Performance Anxiety. Do not judge what just happened or is about to happen. Self-judgment during a performance is futile because it takes you out of the present and into the past or future and destroys the natural flow of your thoughts and physical actions. Whether the judgment is positive or negative, it introduces a verbal aspect into an activity that is most successful when it is non-verbal. Be on stage, not in the audience. Be in the giving mode, not the receiving one. Be in the music, in the moment. These are three ways of saying more or less the same thing. You cannot be performer and listener at the same time. Leave the response to the audience. The entire piece is worth reading, and probably applies to most artistic endeavors, not just music. I just got home from a bell choir rehearsal. We are preparing for a concert that will be at my church on October 24 (at 7pm! You should come!). The music is a very cool assortment of gospel and patriotic music, including some really fun pieces that are rarely heard on hand bells, like Dry Bones and This Land is Your Land. Today’s rehearsal was a sectional — we rehearsed with 5 people, covering just over an octave of bells (we have a 3 octave choir), and focused just on the parts that were difficult for us. It was a really good, focused, and useful rehearsal. I am heading up our publicity efforts for the conert. I’ve mailed sent fliers to about 90 local churches, I’ve posted announcements on community websites, and I’ve posted on Craig’s List. I’m about to send e-mail messages to several dozen churches, and to about 10 directors of music. Someone else has sent fliers directly to other area bell choirs, and yet another person is putting an ad in the local paper. Next week I’ll put up fliers at local grocery stores and Panera restaurants, and I’ll post a fresh CL announcement. I’ve been struck by the mix of dead tree publicity and electronic publicity I’ve come up with. I hope that I’m reaching different people via the different channels, but of course I won’t really know that. It will be interesting to see how many people come to the concert. I have been reading The Great Society Subway. It’s a history of the Washington, DC Metro system. It’s fascinating. The details of the design and architecture of the system are interesting, especially the conflicts between the engineers and the architects, who had very different understandings of how people move through a space. The Metro was the first major subway system to be built in the Age of the Automobile, so many of the design constraints were unknown — for example, there were no models to predict the association between commute length and ridership. The process through which the design developed was also interesting — I really enjoy reading about how architects think about the interaction of people and their designs (at least, when they do think about it). But the best part of the book is the detailed account of the shifting local political scene between 1950 and 1980. The metro was designed and built during this period of transition, when DC residents got the right to vote for president, got a city council and mayor for the first time, and gained more influence over local projects like the Metro. I live in the DC area, so this is probably of more interest to me than it would be otherwise. The book also explained several things about the system that have puzzled me, for example: why were connections between spokes of the system (such as between Rockville and Silver Spring) omitted from the original design? why is there no station in Georgetown? why is the lighting so dim? why is it so quiet? why are some of the underground stations so deep? why do the blue and yellow lines share so much of their route? And it drops in details about the system that I never thought about, for example, that the stations were designed to feel like an outdoor street, and that the system really is a combination of a regional commuter transit system and an urban subway. It’s really a great read, although it may be of more interest to people with a personal connection to this area. 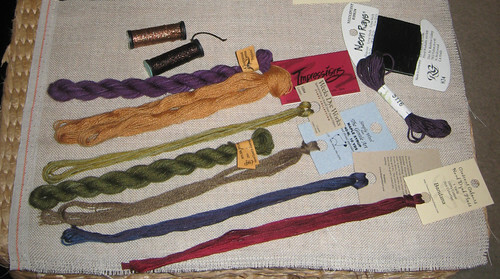 I’ve been getting ready for my Personal Library of Stitches embroidery class. 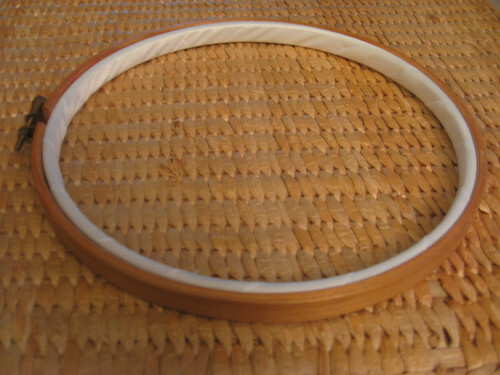 I will be using a wooden embroidery hoop. I’ve had this 8-inch hoop for a million years. I decided to bind the inner ring to give it a bit of a cushion since I will be embroidering on linen. I followed the instructions on the Needle ‘n Thread website. It was very fussy, and I’m not convinced it will make much difference. I’m not sure I would bother doing this again. Kreinik metallic, fine braid. Color 02HL. The color is shiny copper. Kreinik metallic, narrow ribbon. Color 022. It’s black, flecked with copper. Gumnut yarns poppies. Color 238 50% wool, 50% silk. Caron Impressions. Color 1103. 50% wool, 50% silk. Weeks Dye Works. Color 1264 “loden.” 100% cotton, multi-strand. Gumnut yarns poppies. Color 648. 50% wool, 50% silk. The Gentle Art, simply wool. Color “maple syrup.” 100% wool. The Gentle Art, simply shaker. Color “black raspberry jam.” 100% cotton, multi-strand. Crescent colours. Color “bandana.” 100% cotton, multi-strand. Neon Rays needlepoint ribbon. The color is dark green. 100% rayon. And underneath all those goodies is the fabric I will be using. It’s Zweigart Dublin linen. The color is called “flax.” This is my first experience with a real needlework fabric. I had no idea what I was doing when I bought it, but the lady who helped me at the shop was very helpful. In addition to those supplies, I already have a small stash of pearl cotton, mostly size 5 and a huge collection of DMC floss. I’m sure I will be using those too. I also some knitting yarns and other fun things. I think I’m ready. I’ve signed up to take an online embroidery class called Personal Library of Stitches, taught by Sharon Boggon. Sharon is a crazy quilter who writes at Pintangle. The class isn’t really about stitching — it’s about using design principals to explore stitches. I’m looking forward to the class, although I am a bit dubious of how such a class will work. The classes are sent out by PDF, and there’s a private forum to get feedback from Sharon and from other class participants. The class starts Tuesday, and I’m spending some time this weekend buying supplies. It will be fun! 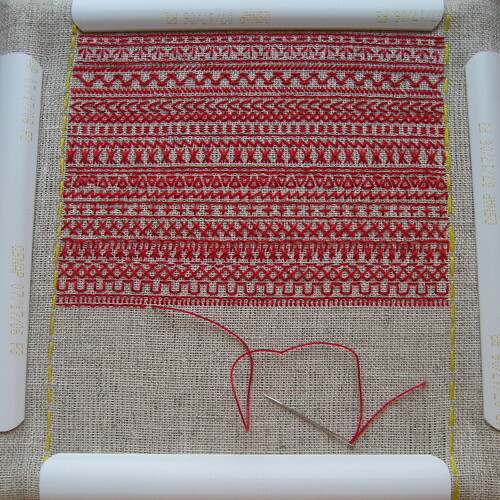 I am working on a redwork embroidery sampler. I’m not following any particular pattern — I’m just trying out a variety of stitches. I’m working from three different stitch dictionaries and picking stitches that seem to go together. I’m using back stitches and running stitches to define segments and to rest my fingers (and your eyes). 4: detached straight stitches, arranged like flower stems.